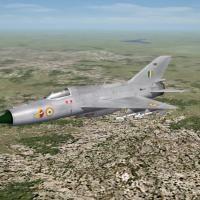 This is the MiG-21FL as used/produced by HAL for the Indian Air Force. There are 2 full versions of the aircraft in this package, both the Early and Late models. This is a nationalized, single-user version that will create 2 new seperate aircraft for your enjoyment. The 77 (early) has 7 skins, and the Late has 3. All decals/serial numbers are 100% historically correct for this model. A new weapon, an several "other items" are added - the GP-9 gun pod, and some other 'goodies' added via the FakePilot method for the 77Late. This package is the compliation of work by many talented people -- they are in the text file called "ori-readme.txt" by PauloPanz. You'd do well to read it, and thank them. I just assembled this package. With thanks to my teamates from the India/Pakistan Mod! !